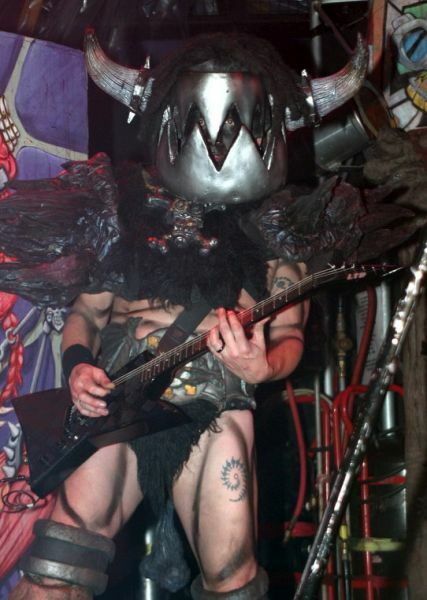 Sad news from Camp GWAR as news reaches is that guitarist Michael Derks – better known as BälSäc the Jaws of Death – has been diagnosed with myelofibrosis. The band and friends of Michael have started a GoFundMe campaign to help his ongoing medical expenses and also to raise awareness of this condition and how you could help Mike, or indeed another sufferer. Further details below lifted from the campaign page. My brother, Michael Derks – better known as Gwar’s legendary guitarist, BälSäc the Jaws of Death – after experiencing extreme fatigue on tour, was recently diagnosed with Myelofibrosis, a disease that causes scarring inside of the bones and interferes with the marrow’s ability to produce blood cells. He needs a matching donor for bone marrow replacement, and the procedure has a 15% to 30% mortality rate. If he does not get the surgery, he has only three to five years to live. Mike’s out of pocket expenses are already around $80,000, and once the process starts, he will be unable to work for a year. The vast size and elaborate scale of Gwar’s stage shows means they put most of what they earn right back into the production, and without your help, my brother has no hope of paying these huge and growing bills himself. Your donation will go toward saving his life – it’s as simple as that. My name is Michael Derks, but I am more widely known by my stage name, BälSäc the Jaws of Death. I’ve spent the last thirty years behind a mask as the guitarist for the shock rock band GWAR. And that’s where I’m comfortable, behind the mask. I am not someone who enjoys putting my life out for others to see on social media, and I do it now only because I know many people are concerned about me. This summer while I was out on the Warped tour, I began to experience extreme fatigue and weakness. Eventually it got to the point where the people around me insisted that I go to the hospital. I was treated for severe anemia, but extensive testing did not reveal a cause. When I got home, my haemoglobin levels continued to fall and the only course of treatment has been a series blood transfusions to keep my red and white blood cells from dropping to dangerous levels. I went for further testing at the Massey Cancer Center at MCV and the doctors there have diagnosed me with myelofibrosis, a disease that causes scarring inside of the bones and interferes with the marrow’s ability to produce blood cells. If left to run its course the doctors say I am most likely to only survive another 3 to 5 years. There is a treatment with a chance of curing my condition, a bone marrow transplant. This procedure involves destroying my diseased bone marrow with high doses of chemotherapy, and then replacing it with healthy marrow from a donor. I will hopefully have the transplant early next year. I will spend a month in the hospital and then at least a year in recovery, where my immune system will be practically non-existent. The procedure has a mortality rate of 30%, but the Massey Center has brought this down to around 15%. With my family’s help and the support of my friends, I will beat this. Since the only thing I can do while the doctors try to find a matching donor is to get myself physically fit, I’ve decided to not let the impending hospitalization keep me from doing what I enjoy most, performing with GWAR. I will be joining them on the upcoming North American tour where we will be playing many of the songs from our new album, The Blood of Gods, a record that I am prouder of than anything else I’ve put out in my 30 year career. I will be using labs across the country to monitor my blood over the next 2 months as we travel and will probably have to leave the tour at least once to come home for a transfusion, but as hard as the road can be, I look forward to the curative effect it can have on my soul. Everyone I have told about my condition have asked what they can do to help. I have teamed up with the incredible people at Love Hope Strength to offer a way for my friends and fans to not only help me, but all of the thousands of people out there in need of a bone marrow transplant. We are running a virtual drive to find donors to join the international registry of people willing to save a strangers life. So, please, if you are willing and able, become a donor today. There is no obligation, it will just allow you to find out if there is someone out there whose life you could save.